Here Comes the Martha Train! CHEW! CHEW!- Soft and Chewy Chocolate Chip Cookies!-292 eggs, 215 1/2 cups of sugar, 218 1/4 sticks of Butter, and 276 1/4 cups of flour used so far- 1 recipes to go! It’s been a very long time since I visited this blog. To be honest, I’ve been disheartened and pretty damn depressed with how life has been going lately. It’s gotten so bleak, I rarely even bake a batch of cookies anymore. I’m not the only one who’s been feeling this way. My husband, Dan has had a great deal of stress, too. Before I get into this, I should probably address the cookie pictured above. 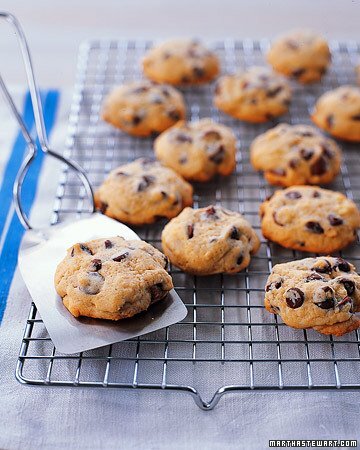 Martha has three different chocolate chip cookie recipes in her book: a regular, a thin and crisp, and a caky chewy one. This, of course is the latter and it’s not a bad cookie if you like caky textures. Personally, I’m not fond of caky, chewy cookies. I like a crisp, salty buttery cookie, but to each their own. It’s relatively easy to make and if you need to throw something together in a hurry with a high yield, these would probably not disappoint. I’m not sure if there’s anything particularly special about these– no unusual Martha-esque ingredients, no special preparations, just a simply chewy cookie. If that’s your thing, then go for it. The quote I’ve cited above has always been one of ambiguity. It is one of the shortest chapters of any book ever written. As I Lay Dying is a brilliant and heartbreaking novel by William Faulkner. In it, each chapter is told from a character’s perspective. In fact, each chapter is simply named for the character speaking. In the case of the quote above, the character is the youngest sibling in the Bundren family. Vardaman is a mentally disabled boy with no education. He spends his days fishing in the creek and copes with his mother’s death with these four simple words. Scholars have debated what it means. It is, for many, a very ambiguous statement, but one I now feel I profoundly understand. My mother-in-law took a fall in her home where she lived independently. It was a subsidized dwelling for the aged. She had her cat, her car and her choice of which Walgreens she wanted to visit depending on her mood. Lawrence, Kansas is a sleepy little town dominated by the University. She moved there when Dan went to college. Later, he moved 45 minutes east to Kansas City. She stayed. Rosemary didn’t like change. Most people her age don’t. As I age, I can certainly sympathize. Change means things unknown, and the unknown loses some of its appeal as we get older. Unknown usually means struggle. Unknown usually means… well… unknown. My mother-in-law Rosemary was a quiet lady. So introverted she was practically concave, I’d joke. She was kind, though. A simple farm girl from a town in Illinois, she married an aerospace engineer and bore him four children. The last one came late in life. It’s the one I’m most thankful for, mostly because I married him. Her husband passed away in the early 2000s, but he had left her and my husband on their own long before that. It was just her and him for many years and they were quite close. She suffered a fall a few years ago which landed her in rehabilitation. Falls do something to the elderly. Psychologically, it’s a traumatic experience. Rosemary’s fall was no exception. She spent nearly two days on the floor of her bathroom, kept conscious by her cat’s visits. Thank goodness for the nosey neighbor who noticed her mail had not been retrieved. So, Rosemary ended up in the hospital and it became apparent that a return to her apartment in Lawrence would not be possible. Instead, she would move to an “Independent Living Facility” in Overland Park. We jokingly called it the cruise ship. Meals would be served in the dining room three times a day by a wait staff. There would be entertainment nearly everyday. Ice cream socials, bingo, and organ with Dwayne. Rosemary was not happy. She didn’t like change and she wasn’t especially fond of people. This was, after all, communal living and she was not having any of it. She lived there for a time and adapted to her new way of life. In time, her cat Kitty-Diddy (named for P-Diddy – she thought this was funny) passed on, leaving her with even less. Dan and his brother visited her almost everyday bringing her groceries, medications, and clean laundry. We could all tell that she was struggling, though. She would put a good face on, but she was slipping away in conversation and her comprehension was waning. She suffered a few very aggressive infections which landed her more than once in rehab. The last time meant she could not return to independent living. She would need nursing care full-time. Her decline hastened at this point and soon there was a hospice worker assigned. Dan would come home from his visits with tears in his eyes and simply fall apart. It’s been a sad year. This kind of stress can make for a precarious time in relationships and, to be honest, ours was strained. We mustered up enough compassion for each other to see it through, though. The same might not be said for our family members. Things got uglier than they needed to be. This happened with regularity. We both became accustomed to the steady cadence of disparaging remarks and cruel criticisms. This didn’t help the situation, though. Toward the end, our concern was with Rosemary. We wanted her to leave us without pain and knowing she was loved. She did. We had visited her that Saturday morning after Memorial Day and we could tell she was approaching the end. Her body was giving up and she laid silently, her mouth opening and closing as she took in what air she could. We sat with her and spoke with the hospice nurse. We left to fetch groceries for the house and just as we arrived back home, we were called to return. Her color had changed and the breaths were less frequent. We cried and held her hand. We spoke and hoped she could hear our voices. Soon the breath stopped and she was freed. It was a quiet and lovely moment. Last week, Dan and I were contacted by our friend Charla. For years we’d enjoyed our regular lunch meeting with the old gang- Charla, Mary, and Art. These three were long-time friends from an earlier time in Kansas City’s history and they welcomed us into their fold. Art was a tall, lanky, crusty, Jewish, gay octogenarian with a sharp tongue and a wicked sense of humor. It was always a treat to hang out with him and he made us laugh often and remembered our birthdays and the holidays with a card and a box of Russell Stovers chocolates. He had been trimming bushes in his yard while standing on a ladder wearing flip-flops. He fell and ended up in the hospital with a broken arm and leg. No one contacted any of his friends because his prognosis was good. That is, until a CAT scan revealed an area of his brain bleeding. The bleeding increased and surgery was out of the question at his age. As instructed in his living will, he was moved to hospice. On the way there he lost consciousness and never woke. I went to visit him and was greeted by Charla and his sister Jean. I sat and held his hand and spoke to him. His breathing was all too familiar. In and out… In and out… mouth open… mouth closed… mouth open… mouth closed… then nothing. He was gone. We wept. Faulkner put these words into poor Vardaman’s mouth. To a boy with limited mental capabilities, he saw his mother slowly slip away just as I had witnessed the loss of two dear people this last month. Like a fish out of water, our bodies cling to this world, desperately pulling in what we can as we prepare to leave. I used to think this line of Faulker’s was a quirky, twisty bit of word play. It’s not. Like Vardaman, my brain doesn’t understand the nature of final farewells or what comes next. I have no concept of heaven or hell. I can only comment on what is before me. Sorry for the bleak and somewhat maudlin post, but that’s where my brain is these days- I’m trying hard not to let my heart live there, though. Maybe my next blog should be around Mr. Boston’s Bartender’s Guide. I love you. That pretty much sums it up, and if I could wrap that up in different sized, colorful boxes and place it on your doorstep everyday for you and Dan to open as a reminder that no matter what love is waiting for you two every where, I would. But since I can’t, just know that I love you, and thousands of others do so too. Let that rain down on your disheartened spirit and hopefully wash it back to joy. Love ya. I love you, too, Ross. How is fatherhood? You look very happy. Andre, You and Dan will be in my prayers. as we get older we have years like this until we ourselves are focus of such a year. we need to remember that not only should we grieve but also we need to celebrate a life well lived. You and Dan were there to make these lives better through family and friendship. Well done Fish! Thanks so much, Pabby. Miss you very much. Oh, Andre- What a happy time to see you back on my screen ! Sorry to hear about your news, but it’s bound to get better. Have faith and love one another like crazy. You are a very important addition to my messages, please continue the column. I so look forward to them! I am all for a bartenders compilation, I will read whatever you write,regardless. Did you ever think of an occasional restaurant review ? Not the big ole JoCo places. I mean the offbeat, unusual that I would never find w/o help. You are wonderful. Good to hear from you, too, Jenny. Sorry I’ve been so remiss with my postings of late. Not sure if I would be a match for restaurant reviewing. I’m not a critic at heart and the world is filled with so many critics already and not enough aficionados. Not entirely sure if Dan and I will be in KC much longer, too. Either way, I’ll always write something. Just not sure what. I have missed your blog, but this entry did not disappoint. I’m sorry for all the unhappiness you have suffered recently. Your descriptions of the death of loved ones are eloquent and so familiar to me (both my parents, and both of Royal’s parents). It is true that death brings out the best, but also the worst in families. These rifts are painful, but usually fade with the passage of time. Patience. Love. Life is too short. Faulkner?! Yes he is brilliant, but also extremely depressing (to me). I have to temper my reading of Faulkner with something at the opposite end of the spectrum: Tina Fey? David Sedaris? It looks like you have only one recipe to go. I would welcome a bartender blog. Peggy- Thanks so much for the kind words. Yes, I enjoy a good Sedaris. Hugs to you, sweet lady. Thank you for sharing, Andre. Your description is very moving. Wishing for better times for you and Dan. 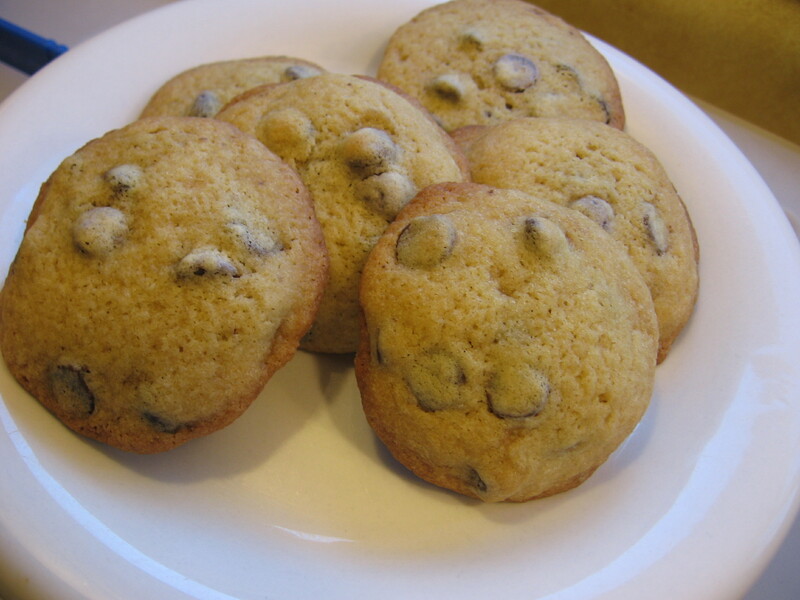 « Martha’s Creme de Cookie! – Cassis Crisps! -290 eggs, 213 cups of sugar, 216 1/4 sticks of Butter, and 273 cups of flour used so far- 3 recipes to go! Show your support by sponsoring me in AIDS Walk, Kansas City 2012! Here's my friend, Scott's blog. If you love words, you'll love this blog. Scott is one of the funniest and smartest people I know. I should probably hate him, but he's just too darn lovable. I've a new friend. His name is Ethan and he is one talented motion designer. Click here to view his blog- 2 and a half D. It's a great exploration of the world of buzz & whirr. My friend, Andrea is an amazing photographer and her work is just exquisite. Check it out here! My friend, Dawn DeDeaux is a New Orleanian with an awesome body of work. She is an installation artist with a limitless imagination. Check out her site here. My friend, Don Sumada is an amazing photo stylist. Check out his work here. My friend, Emily is a vegetarian, an advocate for community farming and local agriculture, a new mother, and a really terrific writer. After all, Everything begins with an E.
My Friend, Jen's Blog. She is an artist, a humanitarian, and a huge animal lover. My friend, Marcos is an artist and designer who not only plays with color, he makes it dance. See some of his fanciful explorations here. My friend, Steve's Blog. Steve is a character artist of the highest order and just a damn nice feller. My friend, Wade, loves furniture, design, gadgets, gizmos, and all things I can't comprehend. He is wicked smart and has a really nice blog. Check it out. This is David Morris' Website. He's the guy who taught me how to photograph my cookies. This is my friend, Russ' blog. Russ has a singular and delightfully twisted point of view. I hope to one day be as funny as Russ. This is the link to the Brooklyn Kitchen as mentioned in my blog post- Drop and Give Me Cookies! Thomas Pluck is a man-about-town with an affection for food, movies, and life in general. Here's a link to his aptly named Blog. Not bad for a guy from Joisey! Want to learn everything you need to know about Brownies? Go to Holly's site. It's death by chocolate but what a way to go! Want to subscribe to this blog? Click here! Just a forty-something word-monkey with an affection for baking and telling stories.